I mean, Japan seems to mostly breed for middle distance and stayers, horses that will excel from 1 1/4 miles to 2 miles. If they want to win top races like both phases of the Tenno Sho, along with Japan Cup, Arima Kinen, etc. That alone could contribute to a longer and lankier stayer-type. *Empire Maker's average winning distance on the dirt in Japan is 1592m. Does anyone have any idea about how these numbers will be compared to those of major stallions in the US (and in Europe)? BaroqueAgain1 wrote: The Japanese horses are all so lean, with a greyhound look. But Makahiki takes that to the extreme, with his really deep shoulder/chest tapering up to a wasp waist. I know that the Japanese haven't actually created a new breed of TB, but they sure look different. I presume that, along with breeding for a less muscular type, they also employ different training and feeding regimens from what we might see here in the US. They look as thoroughbreds should look imho, very classic looking and evocative of 18th and 19th century oil paintings of race horses and famous studs or broodies Lean, elegant, athletic. (Let's not forget TBs used to regularly run 4 mile races sometimes 2 or 3 heats in a day so up to 12 miles, including the horses here in North America, so it makes sense that horses bred for middle/classic and stayer distances would look like the old depictions out there). You see a similar separation of body types in human sprinters vs marathoners and distance runners. TBs in general have a mixture of slow twitch and fast twitch muscle fibre genes. Quarter Horses have fast twitch and Arabians have slow twitch. Selective breeding in TBs could impact the amount from one line/individual to the next. And of course training is a factor. Maybe also the way the (legal) drug use impacts the metabolism. How good is Ryan Moore? Probably good enough that his mere presence in the saddle will drop Idaho's odds. Wow, I didn't know he made it to SIX - when I went to bed he was four-for-four which was pretty incredible by itself. The weather looks nice. That's good. When I watched Kitasan Black win the Tenno Sho Autumn (I think? ), the horses looked like they were running through a marsh in the middle of the Monsoon. 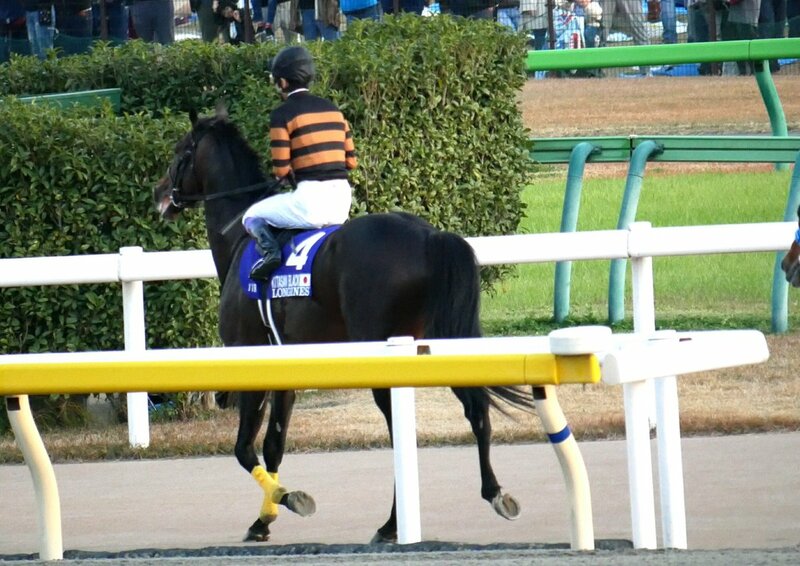 OMG Kitasan Black looks sooooooooooooo good in the paddock. I can't even. ETA: Rey de Oro looks fit too, but Mr Black is just built like a beast at the mo. Boom Time has a lovely walk, a long swinging stride. Idaho is all tail-swishy & head tossing... not in an upset way, but he's a bit keyed up. That's typical Idaho. Actually, that's pretty much many Galileos. You could count on his bro, Highland Reel, to work up a good sweat before his races, as well. What a finish. My hands are shaking. Cheval Grand by a length over Rey de Oro & Kitasan Black, just heads apart. ETA: Makahiki fourth & Idaho up for fifth. ETAA: I didn't know that Cheval Grand is half to *both* Verxina & Vivlos! What else is there to say but... WOW. They should make a statue of Kitasan Black and set it up at Tokyo, like the statue of Yeats at Ascot. He's sooooo handsome. ETA: Too bad he couldn't hang on, but that was a good run by Cheval Grande. And a very fine ride by Hugh Bowman, Winx's jockey. Ol' Hughie's having a pretty nice year. Congratulations to Cheval Grand. Lovely horse and a direct tail-female descendant of the great mare, Glorious Song. And, of course, he's a grandson of Sunday Silence. Yay for Cheval Grand(JPN) and his sire Heart's Cry(JPN)!!!! But, obviously, the greatest is Cheval Grand's dam Halwa Sweet(JPN) who's produced three G1 winners!!!! Her 3rd dam is the legendary Glorious Song(CAN). Cheval Grand will be teamed up with Hugh Bowman again in the Arima Kinen. And he will remain in training next year. Thrilling finish! Congrats to Cheval Grand, how exciting that he'll keep running. Hmmmm... I don't think anyone was going to catch Cheval Grand, but interesting nonetheless. ...... missing a shoe after the Japan Cup. It was on at the finish.